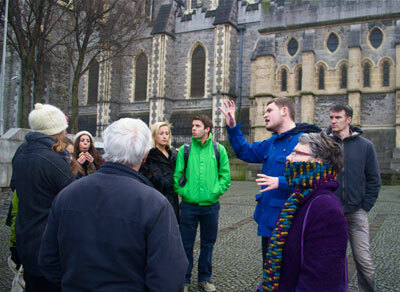 The Historical Walking Tour of Dublin is the longest-established walking tour in the city. It was established in 1986 with a very specific aim to provide post-graduate history students of Trinity College Dublin (TCD) and the National University of Ireland with an income during their years of study. Our Guides are dedicated to the view that the highest academic standards are not incompatible with a pithy and entertaining presentation of the country’s history—to visitors and locals alike. More than just sightseeing—although there’s plenty of that too—our tours explore the dynamic nature of a city and society that wears history on its sleeve like few others. In addition to our year-round scheduled tours, clients include corporate, conference and tour groups such as Rick Steves Ireland with whom we have been working for over 15 years. The Historical Walking Tour of Dublin has been acclaimed as the one “must do” (Sunday Times) activity for any visitor to Dublin and we have longstanding links with all the Irish universities overseas programmes as well as numerous US college study abroad programmes, including Notre Dame and New York University with whom we have collaborated in organizing tours, excursions and lecture series on politics, cinema and conflict resolution. Final year school groups from overseas such as the UK, Germany and Denmark are a speciality. We also offer a range of themed tours for transition year and leaving cert groups. Each summer we conduct themed tours of the city for primary school teachers as part of the Dept of Education extra mural courses.